Every email client promises to fix email, but there are few email clients tackling the toughest email problems like Spark. Spark continues to grow in power and feature-set, and is increasingly one of our must-have apps on macOS and iOS. A strong reason for this is the impressive subset of features Readdle offers in the free version of Spark. All individual Spark features are free to use, and many of Spark’s impressive team and collaboration features only begin to enter paywall-territory once you’ve reached a substantial amount of usage. File storage, shared drafts with multiple collaborators, email templates, email linking, and email delegation are all available for free to some extent, making Spark one of the best value email app clients available today. That last feature — email delegation — along with improved rich text formatting are two of Spark’s latest feature updates. These features, combined with Spark’s extensive inter-app communication, have facilitated my own switch away from Outlook recently. Until the last few weeks, I’d say I was a fairly genuine Outlook fanboy. I love the new design with the bold titles and blue headers, I love the built-in calendar functionality, and I like the way the app quickly communicates with Word and Excel on iPhone and iPad. But the ability to share emails directly into Things 3 (or OmniFocus, or Todoist) or Bear have significantly impacted my workflow and have left me wondering why I ever left Spark in the first place. But first, those new features. The latest Spark update continues the growth of the app’s teams and collaborative features. Email delegation is exactly as it sounds — account managers and team leaders are able to delegate an email to another team member and allows team leaders to stay on top of that email as it is interacted with by the rest of the team. If an email comes in that you need to delegate, you can simply tap or click the user icon in the top right corner. You’re able to add a comment and a due date for the email action to be complete before sending it off to your teammate, and you’re even able to receive notifications as your teammates work on the email. For team leaders or managers with assistants, this feature promises to make email life easier. 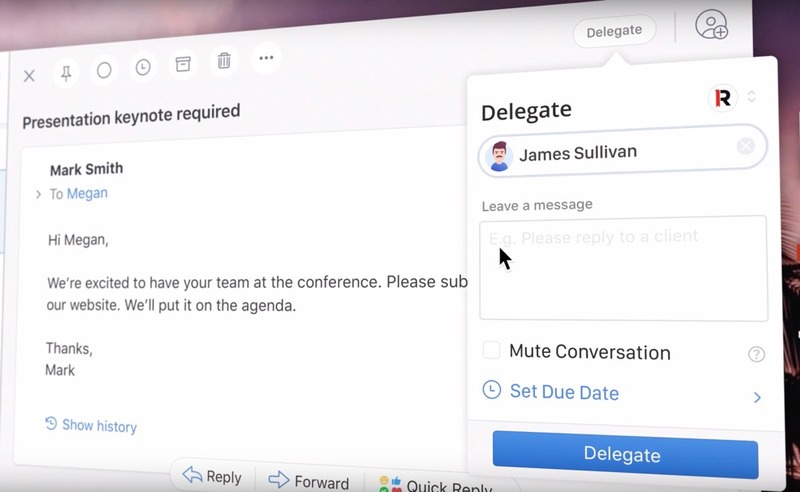 Email delegation joins other collaborative features like collaborative email composition (teams can work together to draft emails, kind of like multiple users editing a Google Doc) and the ability to share and discuss email (emails can be shared as a “conversation” for discussion as a team). For small teams with only a few members, these collaborative email features are sure to make office life easier. And at $6.39/user/month, they won’t break the bank if your team’s needs grow beyond Spark’s free tier. 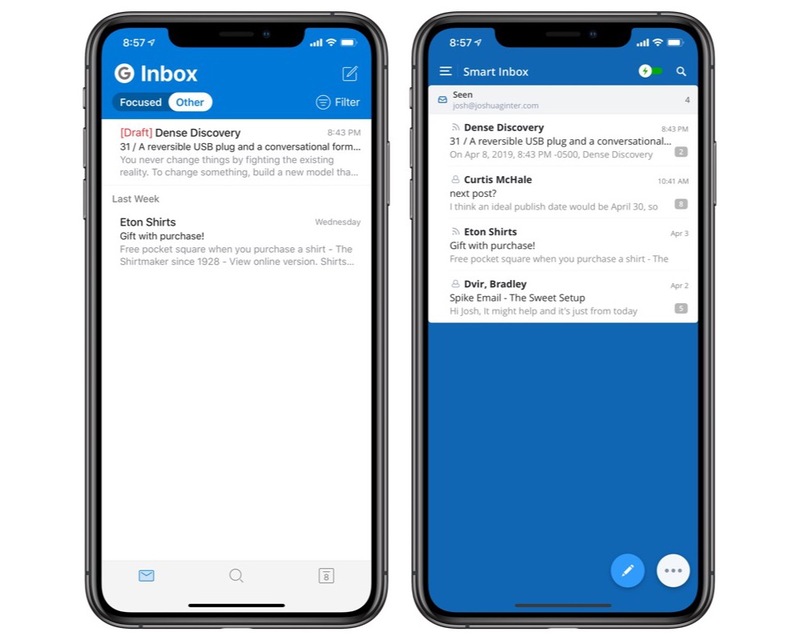 Spark’s email composition view continues to grow in power, and the addition of rich text formatting is a sensible addition to an app that seems to have it all. 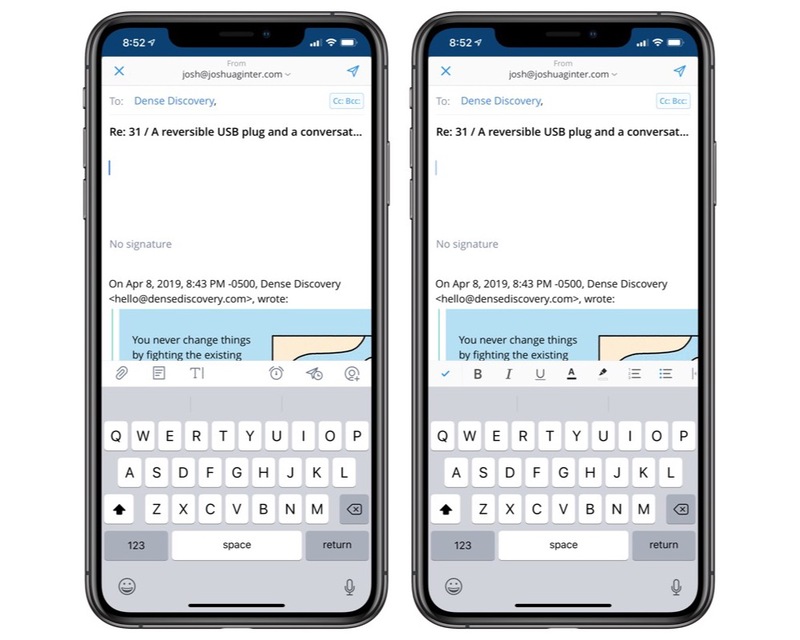 When you jump in to compose an email, or if you’re set to converse about an email with teammates, a new rich text formatting bar has been added right above the on-screen keyboard on iPhone and iPad. Standard mileage applies here: on the iPad with an attached keyboard, most keyboard shortcuts will still reign supreme over using the touchable rich text formatting bar, but the inclusion of this bar on the iPhone makes bolding, italicizing, bulleted/numbered lists, and hyperlinks substantially easier to compose. These features were expected a long time ago, so we’re glad to see rich text formatting come to Spark on iOS. This rich text formatting bar isn’t overly impeding on the iPad, where you have significant screen real estate to fill up before becoming cumbersome. On the iPhone’s less available screen real estate, however, it’d be easy to overpopulate the composition screen if all you were shooting for is email power. 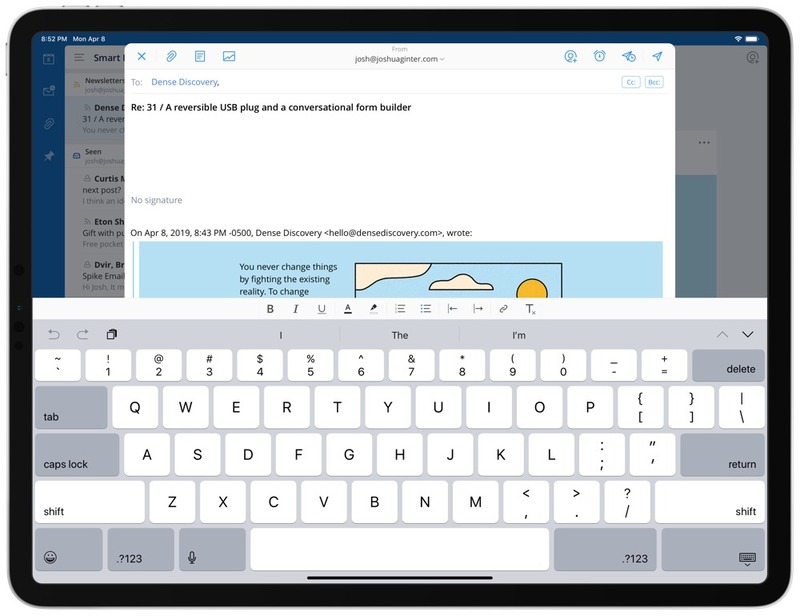 Instead, Readdle has done a fine job adding these rich text formatting options behind a button on the extra keyboard row, ensuring you still have ample room for viewing your email as you type it out. As mentioned above, I’ve used Outlook now for the better part of the last year — probably the longest active streak of any third-party email app. Outlook’s built-in calendar functionality and overall Microsoft Office support helped bake it into my j-o-b office job substantially better than any other third-party email client. But Outlook’s inability to share emails as either tasks or reference notes became bothersome over time, and came to head this last two weeks of Canadian tax season. 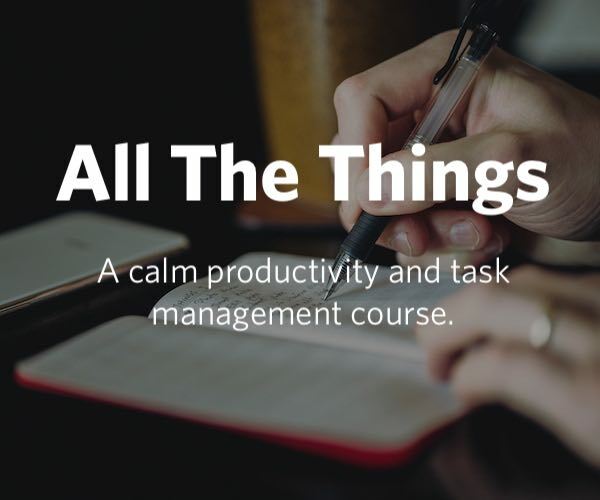 This time of year, my inbox gets bombarded with questions, data, Excel files, and PDFs that need to be dealt with in a timely manner, and Outlook’s inability to share these emails elsewhere resulted in an email list that became too long to control. 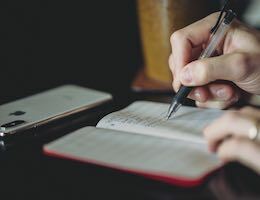 A quick Spark download late one evening and subsequent email triage led to an overly productive evening, and I’ve been able to more efficiently tackle my email list ever since. The saving grace has been the ability to swipe an email right from the inbox list and send it straight to my Things 3 inbox or as a full-on note to Bear. 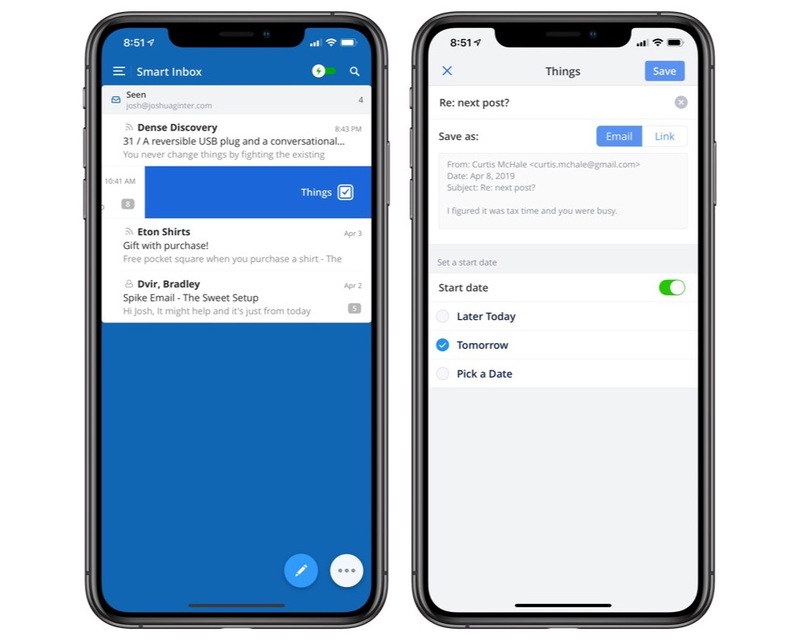 Once swiped (or shared via the share sheet), Spark opens a quick dialog box allowing you to set general parameters for the email; you can send the email to your inbox without any tags or due dates, or you can select a date to act on the email in Things. Once shared to Things, the task’s note is populated with the entire email and a link back to the email in Spark if you need to send a reply to complete the task. 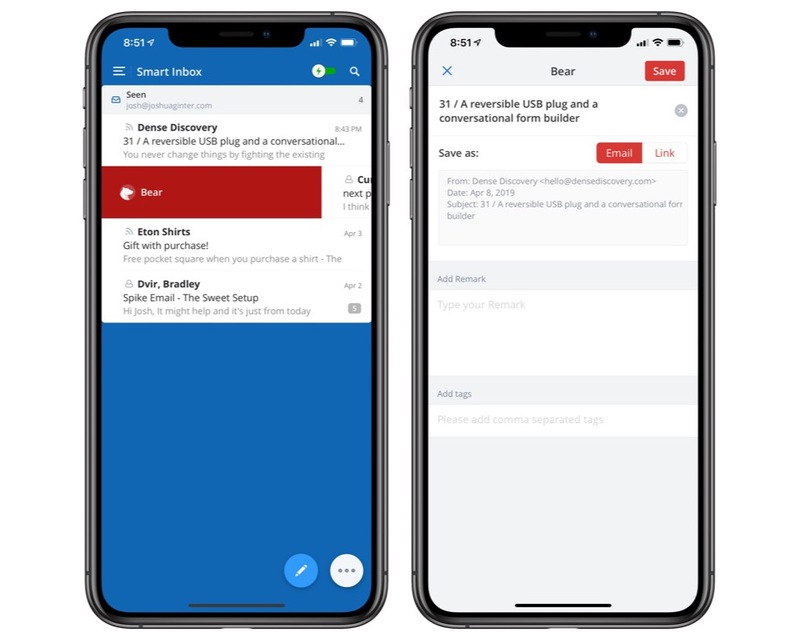 Same goes for Bear — you can share the email to Bear, type a remark in the dialog box, add tags as necessary, and save it to your Bear note list. The new note inside Bear has the entire email and corresponding email thread, along with an “Open in Spark” link at the bottom of the note for easily returning to Spark to deal with the email. Of course, you can share any email with anyone by generating a public link right from the share sheet in an email, making sharing with a teammate who doesn’t use Spark substantially easier than forwarding the email. The number of app add-ins inside Spark is impressive as well. You can add services like Dropbox, Google Drive, and Files, read-it-later services like Pocket and Instapaper, and other services like GoToMeeting and Zoom. Once added, you can share emails directly to your service of choice and cut out a lot of ugly flipping back and forth to work with your email in one app and triage it in the next. Spark continues to evolve at a healthy pace and we’re both impressed with how far the app has come and excited to see where Readdle takes Spark next. So much so that we’re revisiting our reviews of the best email apps for iPhone, iPad, and the Mac to ensure Spark is given a new fair shake thanks to its increasingly extensive list of features. 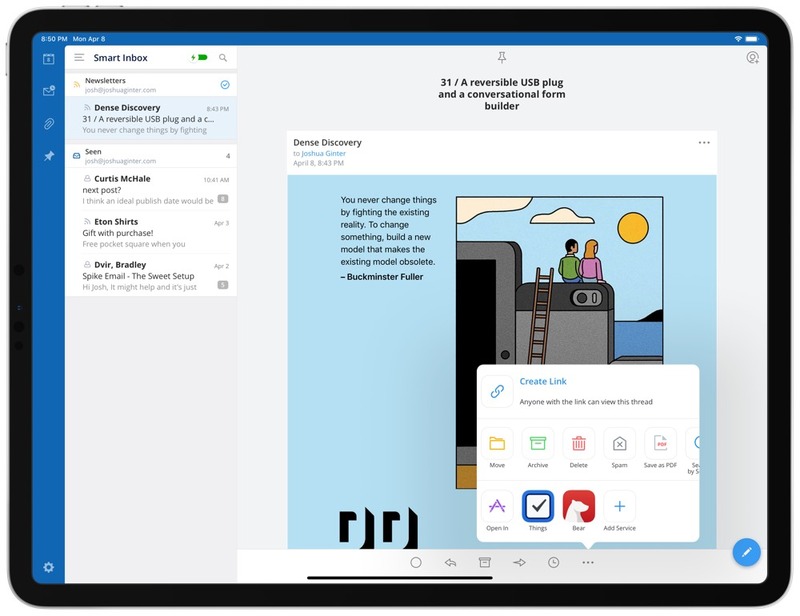 Spark is already our pick for the best email app for the Mac, and something tells me it’s going to give Microsoft Outlook a run for its money in our upcoming review update. You can download Spark for iPhone and iPad for free from the App Store.